If you have been following this blog for awhile, you know I love truffle recipes. Since I am more of a vanilla girl, I wanted to make some Vanilla Creme Truffles. I used vanilla beans instead of extract. The vanilla beans are a must try! They add so much more vanilla flavor without the alcohol taste. These came out quite delicious. I think they would also be good without the chocolate coating. They are also a super cinch to make. If you also like truffles, you may want to try this recipe. It’s one of the most popular recipes on the blog. 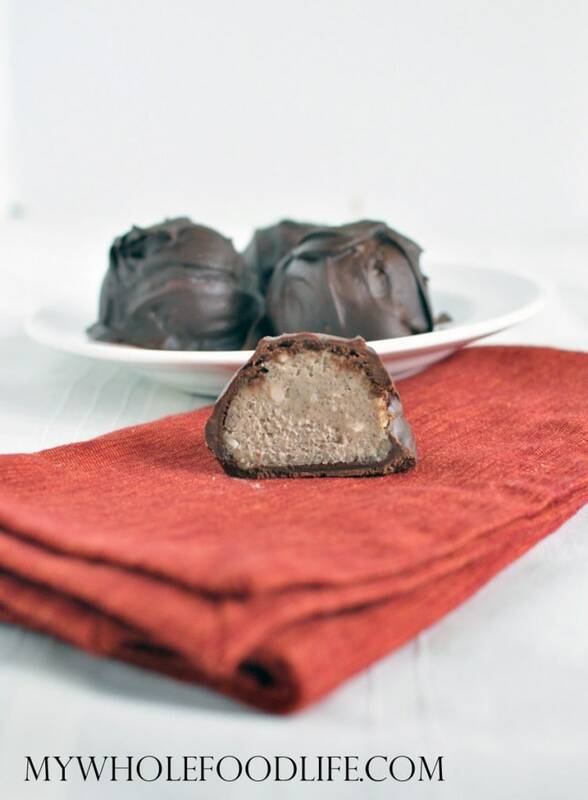 These healthy truffles are vegan, gluten free and paleo. Unlike most of my other truffle recipe, this one calls for a cashew cream for the base instead of coconut butter. I used the cashew cream because I really wanted the vanilla flavor to stand out. So glad I was able to just google your recipes! Had to leave the Facebook group as I am sick of Cheryl Roy Munn constantly hijacking every post and one upping everyone else by saying she already did that or how she roasted brussel sprouts with sweet potato last week when someone posts about it today. . I am also not alone in my thinking. Seriously? Can you give me some examples? These look outstanding! I'm excited to try these for a special treat! :) Such a simple ingredient list. Hi! Love the look of these and the strawberry truffles! Can I sub honey or agave nectar for the maple syrup? Thanks! I'm going to have to try these at some point. I hate it when you get an alcohol-y taste from vanilla extract - but I'm always put of by the expense of vanilla beans. But these sound so yummy they may be worth it! !